Flow cytometric analysis of A20 cells (blue) and MS1 cells (green) using VCAM-1 (D8U5V) Rabbit mAb (Mouse Specific) (Alexa Fluor® 488 Conjugate) (solid lines) or concentration-matched Rabbit (DA1E) mAb IgG XP® Isotype Control (Alexa Fluor® 488 Conjugate) #2975 (dashed lines). 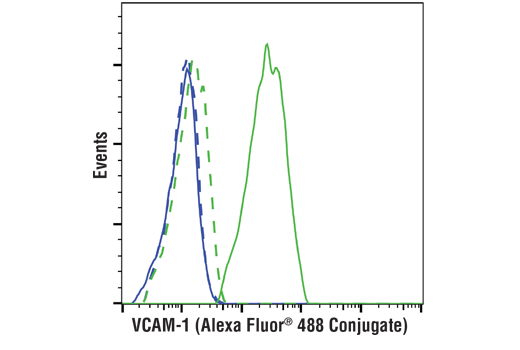 VCAM-1 (D8U5V) Rabbit mAb (Mouse Specific) (Alexa Fluor® 488 Conjugate) recognizes endogenous levels of total VCAM-1 protein. This antibody recognizes both long and short isoforms of VCAM-1 protein. Monoclonal antibody is produced by immunizing animals with recombinant mouse VCAM-1 protein. This Cell Signaling Technology antibody is conjugated to Alexa Fluor® 488 fluorescent dye and tested in-house for direct flow cytometric analysis in mouse cells. This antibody is expected to exhibit the same species cross-reactivity as the unconjugated VCAM-1 (D8U5V) Rabbit mAb (Mouse Specific) #39036. VCAM-1 (vascular cell adhesion molecule-1) is a transmembrane glycoprotein containing multiple amino-terminal extracellular Ig-like domains, a transmembrane domain, and a short carboxy-terminal cytoplasmic domain (1). Alternative splicing generates two isoforms of VCAM-1 (2). The role of VCAM-1 during infection and inflammatory diseases is well characterized. Expression of VCAM-1 is induced in endothelial cells by inflammatory cytokines including TNF-α and IL-1β (1). VCAM-1 on endothelial cells interacts with the integrin VLA-4 (α4β1) on leukocytes to mediate migration of circulating leukocytes from the blood across the endothelium and into tissues (3). Osborn, L. et al. (1989) Cell 59, 1203-11. Hession, C. et al. (1991) J Biol Chem 266, 6682-5. Elices, M.J. et al. (1990) Cell 60, 577-84.